The Roots: Getting Personal In 'How I Got Over' These days, the hip-hop group from Philadelphia is best known as the house band on Late Night With Jimmy Fallon, but The Roots' members have been active together for almost 25 years. Their highly anticipated album How I Got Over is due for release in late June. Drummer/co-founder ?uestlove says it's a mature record inspired by change. The Roots' members have been active together for almost 25 years. 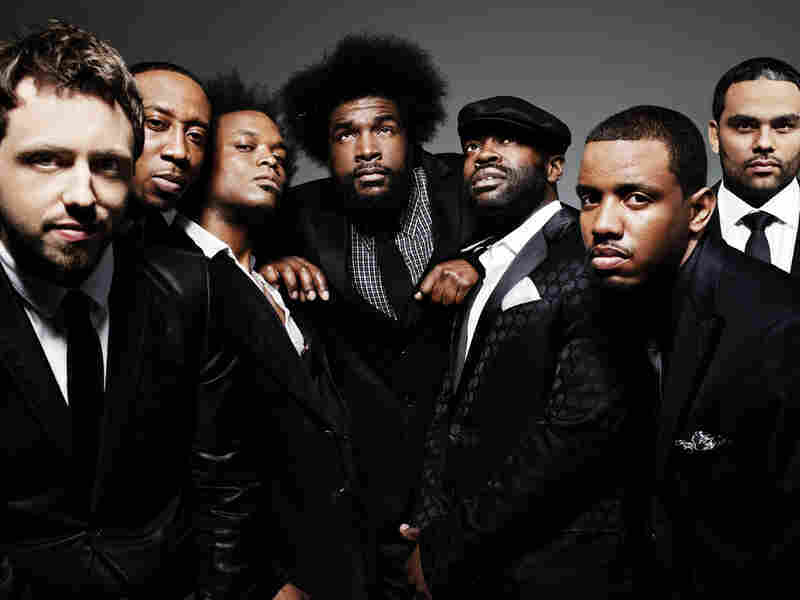 Nowadays, The Roots' members are best known as the house band on Late Night With Jimmy Fallon, but the group has been active for almost 25 years. Led by co-founder and drummer Ahmir Thompson, better known as ?uestlove, the band members got together in Philadelphia in 1987 with a commitment to playing their own instruments and making great hip-hop. Since then, they've stayed the course and also looked to other genres — including jazz, soul, electronic rock and even classical music — for inspiration. Six months ago, The Roots released the single "How I Got Over," from the highly anticipated album of the same name. But How I Got Over's October 2009 released date was repeatedly pushed back. ?uestlove says he and The Roots were perfecting the record in the studio. The album's title references a spiritual song by Mahalia Jackson, but he says it has other meanings, too. "We always feel as though all of our album titles have to sort of reflect a triple meaning," ?uestlove says in an interview with Guy Raz, host of NPR's Weekend All Things Considered. "The state of the world, the state of hip-hop and maybe the state of The Roots." ?uestlove says it's a mature record for hip-hop as a genre. "It's no secret that most of us will be turning 40 in the next few years," he says, "and your life and your outlook is a little bit different back when we were 23 — when we first got our record deal." Although the album was in part inspired by the Obama Administration coming into office, ?uestlove calls it more of a human record. The subject matter is more personal, and he says he's never heard Black Thought, The Roots' MC, sound so vulnerable. In "Now or Never," Black Thought sings, "Everything's changing around me / and I want to change, too." On past albums, Black Thought was given free rein to determine the lyrical direction of The Roots' songs. But this time, ?uestlove says the band collectively voiced what it felt each track should be about. The Roots' members are serious musicians, but they're not always serious. On Late Night With Jimmy Fallon, they participate in comedy sketches, as well as serve as the house band. One of their most popular segments is "Slow Jam the News." "Everyone just assumes that we're so serious," ?uestlove says. "I think it's possible to have a sense of humor and still be politically aware and politically and socially responsible. One of the reasons I really wanted to do [sketches] is because hip-hoppers rarely get a chance to show a three-dimensional side of themselves." When ?uestlove isn't playing on Fallon's show, he's producing other artists' albums, DJing and playing gigs. For now, he says he's able to juggle all the commitments. "It's absolutely possible to multi-task the way that I do," ?uestlove says. "However, there's one thing that separates me from the other eight members of the band: I'm still without wife or child. That all ends the second I submit and say, 'I do.' "
In the meantime, he says he's trying to take advantage of this period in his life. "I know that in the next year and a half, I'm going to eventually get tired of coming home to Ramen noodles and takeout and an empty house and sort of go to another level of my life," he says.